I’ve done quite a lot of international work during my career which is always interesting when you get the chance to visit other parts of the world and see new cultures. But I’m based in London and so I’ve also worked on numerous advertising and PR campaigns in and around this beautiful city, including some fun publicity stunts. 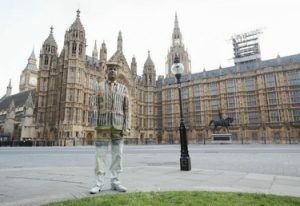 These campaigns all used body painting as the method to deliver their message to the public in a unique and eye catching way. Whether it be for a light hearted PR campaign to advertise a business or possibly a product launch. Or maybe the client might want to highlight an important issue that would be of great interest to members of the general public. 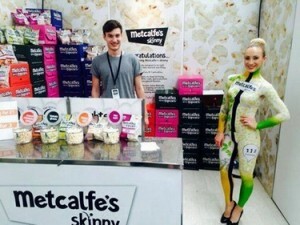 Whatever the reason, body painted models never fail to attract attention. I’ve worked at several iconic London locations, and also on campaigns that made use of props such as the very famous London Red Buses and black cabs. Below are some of my favourite assignments from in and around the city. Back in 2013 I was very pleased to be commissioned to paint 4 models at Victoria Station in London. I had to camouflage them against a backdrop which was a billboard from the ‘Beat Cancer Sooner’ TV advertisement, encouraging the nation to come up with a million actions to fight cancer over a 6 week period. All of our amazing models were cancer survivors. Adam, Anna, Parminder and Linda were brilliant to work with, standing very still for several hours whilst me and my team completed the painting. This was a great campaign to be involved in. It generated a huge amount of interest at the station and was also featured on the ITV news. Bloom is a non- profit organisation whose wonderful work includes preserving the marine environment from unnecessary destruction. In September 2014 they teamed up with ‘LUSH’ an international cosmetics company who use only vegetarian or vegan recipes in their products. They hosted a campaign which included a ‘live’ performance of body painting involving 20 countries and 12 other body artists. The campaign highlighted the diversity of deep sea life and how easily it could be destroyed by deep sea bottom trawlers in remote waters in Europe. 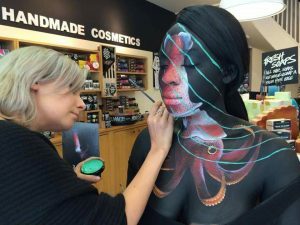 On the day of the campaign I was responsible for painting for the English location and painted my lovely model with an image of a squid at the ‘Lush’ cosmetics store in Regent St London. Whilst other artists painted various other deep sea creatures simultaneously at various flag ship LUSH stores around Europe including Spain, Italy, Finland and Croatia. As a passionate lover of all animals and wildlife I was very pleased to be involved with a campaign to highlight the plight of the wild tiger. The 29th of July 2015 was ‘International Tiger Day’ and countries across the globe supported the campaign which raised awareness of the fact that there are only 3,200 tigers left in the wild which is a 97% decrease in the last century. Action must be taken now if these beautiful creatures are to be saved from extinction in the next 10 years. So I was commissioned to design a live art installation at St Pancras station in London as an eye catching way of promoting the campaign. It was a really early start with cabs at 3 am so that we could get our great models, Susie and Victoria, ready for the rush hour commuter traffic at 7am. In 2011 I transformed 2 models into Mystique and Azazel for the release of ‘X Men First Class’ on DVD and Blu Ray. This included hand making all the latex pieces for Mystique which were then attached to her skin before we painted her body completely blue. Azazel was painted and adorned with his trade mark scar down his forehead to his cheek down across his left eye. There was a week of PR activity with the characters appearing at various locations around London, including a ‘pop up’ lounge at Victoria Station decorated in the style of the 1960’s. The lounge was opened by Jason Flemying who plays Azazel in the film. The models also waited for the tube at Sloane Square and were also then photographed sitting on the busy train. Back in 2006 I was commissioned by the guys at the London based company ‘A Suit That Fits’ to paint a model so that he appeared to be wearing a full 3 piece suit. Once the painting was completed our great model went off around London basically posing in just his underpants. He was photographed in various iconic London locations and situations including St Paul’s Cathedral, The Houses of Parliament and he even hitched a lift on a London Bus and posed standing in a red telephone kiosk. This was a really fun campaign and I find it hard to believe that it was 10 years ago. Harvey Nichols is a beautiful luxury department store located in Knightsbridge. In 2012 I was commissioned by Lexis Agency to paint 2 models with the new design of 2 limited edition Coke bottles ‘Night and Day’ designed by Jean Paul Gaultier. It was another very early start, I think we started painting around 3 am. Once the models were painted they posed in the store window where they attracted a huge amount of attention from passer’s by at the peak of the rush hour. Again this was a very successful campaign and generated 909 pieces of coverage across 33 national and consumer print titles. In 2013 I really enjoyed working on the launch of the UK premiere of Really TV’s CIA drama ‘Covert Affairs’ I had to blend 3 models into 3 different locations to publicise the launch of the show. 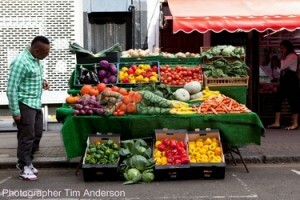 One model was painted into a fruit and vegetable stall in Portobello Market. Another model sat on the back seat of a London bus so that she virtually disappeared and took fellow passengers by surprise. 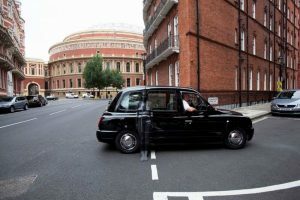 But one of the trickiest locations was when we were blending a model into the side of a black cab. Camouflage body painting works best if there is an intricate background – all the details make it easier to make the model disappear. The side of the cab was quite plain and there were lots of reflections from the windows. But the end result worked out really well. 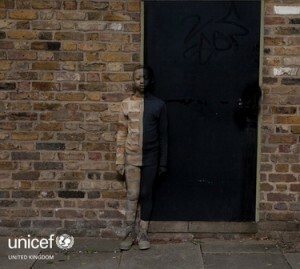 Last but by no means least, is the recent campaign for the Royal British Legion. The ‘Count Them In’ campaign highlighted the fact that veterans are not registered on the current census and are thus ‘invisible’. 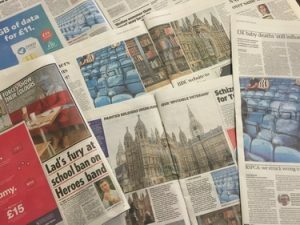 I camouflaged veteran Darren Fuller into the Houses of Parliament. This was a pretty difficult challenge as we started painting Darren at 5 in the morning, so the lighting was changing constantly as the sun rose. 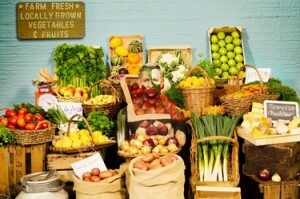 But we were all really pleased with the end results and Darren was an absolute star to work with. This was the final body paint in a series of 4, all set in various locations around the UK. The whole campaign was a huge hit with the media and was featured in numerous papers and online media. For me, it was an honour to meet and paint the models who were all veterans from the armed forces and an absolute joy to work with.